Imagine if you can categorize your Facebook feed to have a photo-only section, and change the display setting preference to mimic the Pinterest layout, browsing photos on Facebook will be an eye-catching and highly addictive experience. Not only will it make commenting and ‘liking’ easier, it will be easier to keep track of your friend’s events and interact with them. But Facebook is strict with its layout and feed aggregation, I hear you say. There is no way to separate photo content from your feed, you add. 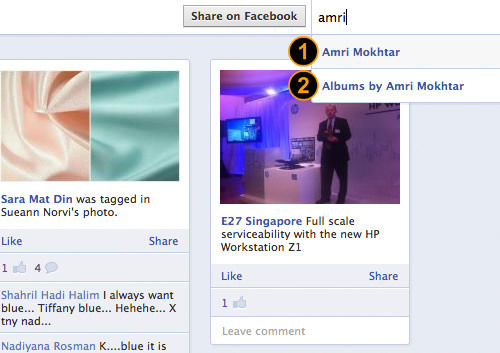 Well, we have found a great way to make browsing photos on Facebook more interesting, by using Friendsheet. 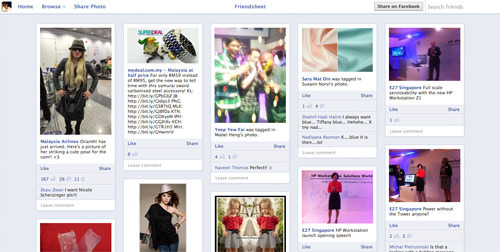 Friendsheet is a web application that will call every photo on your Facebook, which includes photos from your photo album as well as your friends’, and display them in a Pinterest-style layout. To get started with this highly addictive photo-viewing experience, go to the Friendsheet page and click on the button that says ‘Login with Facebook’. Facebook will ask you to approve access; then click on ‘Go to App’. Click ‘Allow’ to start enjoying the Pinterest photo-browsing experience. You will be presented with photo collections from your Facebook feed, as posted by your friends. In other words, you are now ready to browse Facebook photos in a more visual way! Friendsheet is very easy to use and navigate. The first page you will see is the photo collections from Facebook as posted by your friends. To view your Album, navigate to the top bar and hover your mouse over ‘Browse’. As you can see in the dropdown menu, you can select from a few categories. Featured Photos – Select this option to view featured photo collections by other Friendsheet users. Pictures of Friends – Select this option to view all photos by friends, as it appears in your Facebook feed. Pictures of You – Select ‘Pictures of You’ to view all of your photos, including those you were tagged in. 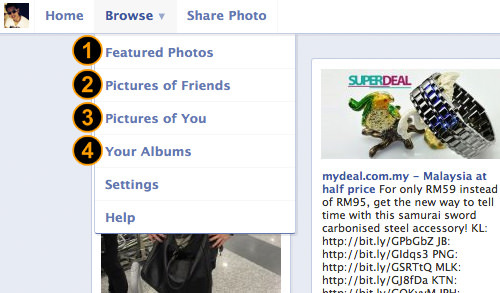 Your Albums – Select this tab to view all your photo albums in Facebook. To browse photos of a friend, hover your mouse to the right of the page, and enter your friend’s name in the name field. Name suggestions will appear to help you. As listed on the suggestion, pick to view photos of your friend, or browse their album. Now when you’re thinking of browsing through your friends’ photos on Facebook in Pinterest style, you know you can do so with Friendsheet. There’s one thing you may need to take note of: there is no notification feature on this page, so you wouldn’t know if your friends have replied to your comments, but you can always refer to your Facebook page to check your notifications.